Learn more at g3boats.com Powered by The Certified Advantage The NMMA® Certified label on a G3 Boat lets you know it was built to meet and often exceed, strict quality and safety standards established by the U.S. Coast Guard and the American Boat and Yacht Council. These standards include 31 categories covering electrical systems, powering, flotation, fuel systems and navigation lights. Certified boats must also pass rigorous annual inspections from independent third-party inspectors. As a result, U.S. Coast Guard statistics show NMMA® Certified boats have been shown to be safer than non-certified boats. NMMA ® 2017 CSI Award Recipient for Customer Satisfaction Aluminum Boats Five (5) Year Bow to Stern Boat Limited Warranty Limited Lifetime External Seams and Deck Warranty to Original Owner Bow to Stern Limited Warranty Transferable to Second Owner Within 5 Years of Original Purchase 1 Year Commercial Limited Warranty from Date of Retail Sale PERIOD OF LIMITED WARRANTY: Any new G3 Boat or SunCatcher Pontoon purchased for personal, family or household use from any authorized G3 Boat or SunCatcher Pontoon dealer in 50 U.S. States, U.S. territories and U.S. jurisdictions, and Canada , will be warranted against major structural defects in material or workmanship as follows: (i) Limited Lifetime External Seams and Deck: main riveted and welded seams in hull to include keel, outside chine and transom to hull seam riveted and welds for the duration of ownership of the first retail purchaser from an authorized G3 dealer; (ii) Five (5) Year Bow to Stern Limited Warranty: structural components, including other welds, bulkheads, stringers, and rivets and select non-structural components, as follows: gauges, stereo, vinyl, and furniture (except as noted otherwise under General Exclusions) are warranted against defects in material or workmanship for a period of five (5) years from the date of purchase. Effective Date: January 1, 2018. Other restrictions and conditions apply. 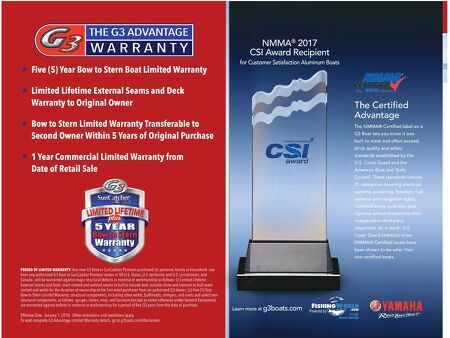 To read complete G3 Advantage Limited Warranty details, go to g3boats.com/Warranties. The G3 Boats Military Instant Rebate Program is open to all U.S. Armed Forces personnel that are on active duty, in the Reserves or National Guard, honorably discharged or retired, including current spouse. This rebate can be used in addition to the other great promotional programs from G3. G3 reserves the right to change, end or cancel this Program at any time. Other restrictions and conditions apply. 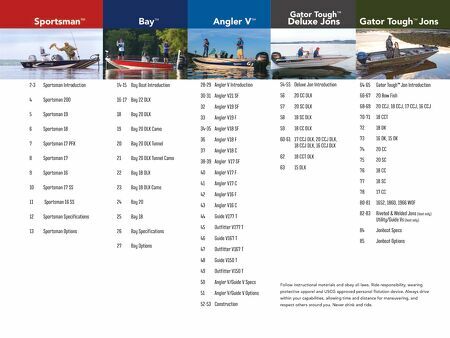 See g3boats.com for complete details. G3 Boats is proud to offer a $1000 Military Appreciation Instant Rebate to those who serve or have served in this great country's armed forces.